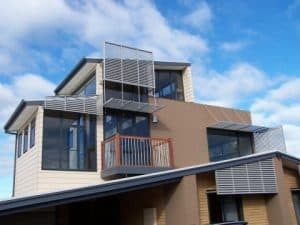 Aluminium screens are a modern addition to any home with a fixed powder coated louvre system, designed for privacy, shading and weather control. These screens provide an effective and stylish shutter look suitable for both residential and commercial applications. Add a screen to your windows, outdoor entertaining area or deck for security and temperature control any time of year. Our modern Aluminium Awnings provide protection from the weather and add privacy to your home. Adding function and aesthetics, available in a range of colours. We design and manufacture our aluminium awnings here in our Hume warehouse for the Canberra climate. An effective shade awning above your window can filter out 90% of the suns heat, saving you money on your power bills. Not only that but a durable product that will outlast its fabric counterpart ten fold. An awning can also protect your windows from rain and hail damage in storms. The material is robust and provides superior protection. 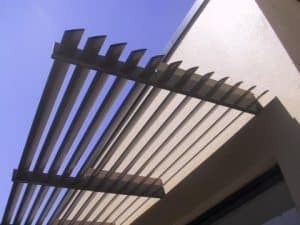 Awnings can also be installed over outdoor entertaining areas or patios, aluminium wont warp rust or fade, which makes it perfect for full sun areas. Maybe you would prefer Plantation Shutters?